The Cronkhite Pavilion is the oldest surviving building from the Washington County Fair during its tenure at the Fort Edward fairgrounds (1872-1933). The building was used at the Washington County Fair as a dining hall. Today it hosts an exhibit on the history of Fort Edward and Hudson Falls (Sandy Hill), from the first people to inhabit the area up to the early 20th century. The Champlain Canal, railroads, the paper industry and pottery manufacturing all played an important role in the development of Fort Edward and visitors can experience their impact. Scale model replicas of the French and Indian War fortification, Fort Edward, and the Rogers Island barracks and hospital are also displayed in the exhibit. In addition, cultural history of the area, including the Bradley Opera House and other social aspects, are presented for visitors. The Cronkhite Pavilion is also home to one of our newest exhibits on Duncan Campbell. 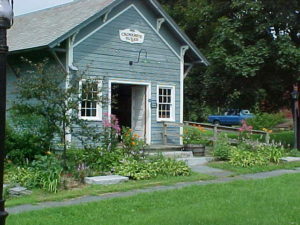 The building is named in honor of James Cronkhite, former president of the Fort Edward Historical Association and long time board member. Mr. Cronkhite was primarily responsible for having the Old Fort House named to the National Register of Historic Places and funded the largest endowment that supports the museum. He also added significantly to the collection of artifacts pertaining to Fort Edward and Hudson Falls (Sandy Hill). Items from his collections can be seen throughout the museum. Closed for the season, except for special events (see listings above). The John P. Burke Research Center is open Wednesdays from 10am to 4pm.